My flight from Sydney was scheduled to depart on Sunday night at 21:35. I decided to use my complimentary pass to the Qantas Club lounge, which I’d earned when I qualified for silver frequent flyer status last year. So I left home nice and early, calling a taxi at 17:30, but it didn’t arrive for almost fifteen minutes, so it was well after 18:00 when I reached the airport. I got to use the priority check-in queue, because the night before I’d received a text message from Qantas saying that my requested seat upgrade to premium economy class using frequent flyer points had been approved, so it promised to be a good flight all round. The woman at the check-in counter apologised, saying there were no aisle seats available, so I had to have a middle seat between other people. But she gave me a bulkhead row, with extra legroom. She also gave me a printed card with details of my return flight on it, just in case Japanese immigration wanted to see evidence that I was planning to leave the country. I passed through into the departure area, where I changed some dollars into yen. The commission fee was outrageous, but I wanted to make sure I had enough to load up my Suica card to pay for a train fare from the airport to my hotel. After getting 2000 yen, I went up the escalators to the Qantas lounge, where they took my complimentary pass and ushered me into the hallowed halls. The area was a bit bigger than I expected, running along a north-facing wall of the terminal, so the windows had good views of the city skyline. There were two buffet areas for serving food, though only one was open at the moment, as the lounge wasn’t very full of people. It had hot soup, fried rice, and a pasta dish, plus a cheese board, four or five types of salads, a cherry cheesecake, chocolate brownies, fresh fruit. Then there was a self serve bar with dozens of wines, beers, spirits, and mixers. And nearby was a gelato bar with half a dozen flavours and an attendant waiting to scoop out cupfuls for anyone who wanted some. I grabbed a small plate and took some chick pea and tomato salad, zucchini, chick pea, and green pea salad, and some potato salad. I didn’t want to eat too much, as my in-flight meal in premium economy was supposed to be good too from the reviews I’ve read. 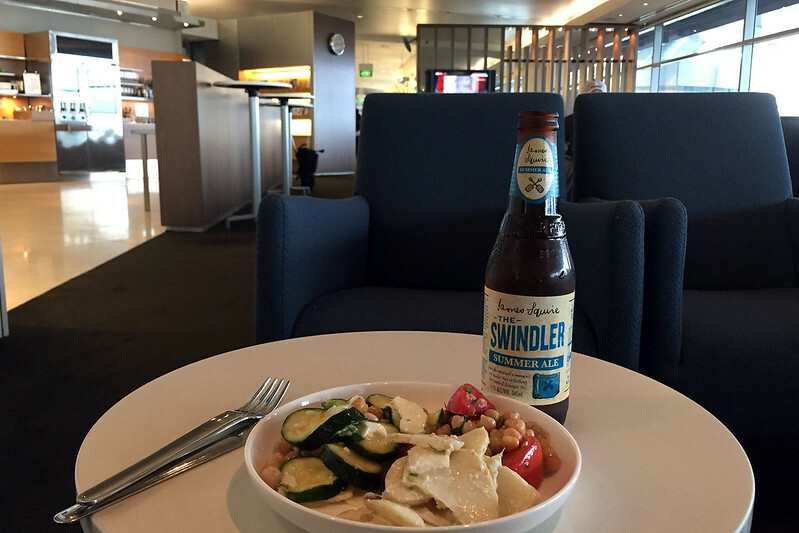 I also grabbed a James Squire “Swindler” summer ale to drink. I found a seat by the window, down the end of the lounge near the closed buffet area, where there were fewer people and more space, and settled into a comfy armchair to relax before my flight. After finishing the salads, I grabbed a slice of the cherry cheesecake and took my time eating that, while watching the sunset light filtering through gathering storm clouds over the city. Checking the weather radar, it looked like a heavy storm was on a direct approach to the airport. Sure enough, it started raining, and there were lightning strikes visible. I wandered up near the gelato bar to see out the windows there, and a lady on the staff informed me that the white flashing lights we could see out the window over on the tarmac indicated lightning strikes within ten kilometres, and would turn blue if there were strikes within five kilometres, which would trigger a shutdown of aircraft movements at the airport. I returned to my seat, and sure enough, soon after the lights started flashing blue. The rain was really heavy, but I didn’t see any hailstones at all, and certainly none like the giant ones that hit Sydney the day before. There was no announcement in the lounge about any flight delays, and soon the storm passed and the lights went white again, so presumably there wasn’t a big disruption. I got some of the gelato then, trying small amounts of the peach and apple flavours. I’d wanted chocolate, but they ran out and were in the process of getting more when I approached, so I had to go back for some of that. It was rather grainy though, so the peach and apple were much better. Eventually it was time to go and board my flight. I left the lounge and walked to the gate, where there was already a short queue at the business and premium economy boarding area. 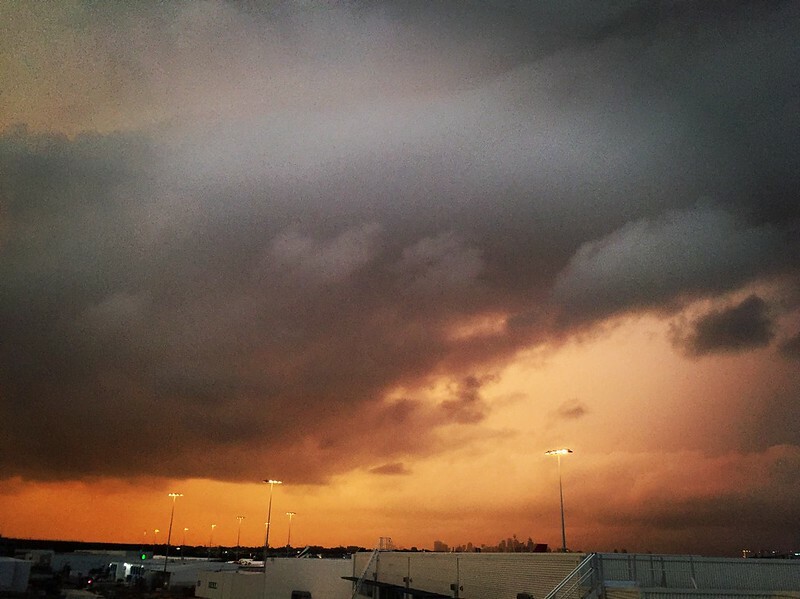 We had to wait a while as the departure was delayed due to the storm, and also because they said the plane had to be cooled down before we could get on. When they finally began boarding for the premium classes, they pulled out platinum class frequent flyers who were flying economy but normally got priority boarding, and said that they would have to wait because they couldn’t board anyone in economy yet. One woman was pretty angry and complained loudly about how the flight was already late. Once on board I settled into my seat. A flight attendant offered me and my neighbours glasses of sparkling wine as soon as we sat down, in real glasses, not plastic cups. There was a middle aged couple on my right, and a young woman travelling alone on my left. She spent the entire time we were on the ground using her phone to text people, even after they asked everyone to put device in flight mode. She was still texting as we were accelerating down the runway, and only stopped once we actually left the ground. She then tucked herself up in a blanket and basically slept for the entire flight, except when the meal came around. The food was better than normal economy, with three choices of dish. I chose a cajun spiced salmon with beans and rice. It was okay, though the salmon was very well done and I prefer it a bit rarer. There was a nice crusty bread roll and a selection of fancier wines than economy class. The dessert was just an apple crumble in a plastic tub like economy though, and I only tried one bite, before deciding I’d eaten enough for the evening and tried to get some rest. Although the seat reclined twice as far and I had plenty of legroom I still wasn’t really comfortable enough to actually sleep. The plane landed in Haneda Airport in Tokyo about 05:30 local time. As soon as the plane landed, the woman next to me was back on her phone sending text messages. I hoped to get out through immigration quickly and then to my hotel, but the queue was longish and took maybe twenty minutes. The whole time I saw the woman from the seat next to me in line behind me, texting continuously. I seemed to get a bad queue when it split into different lanes, as the immigration official on my lane was really slow, and the texting woman who began several people behind me got through before me. But I didn’t need to collect luggage and so got out very quickly after they stamped my passport. The next step was to find the train and travel to my hotel. The station was easy enough to find by following the signs in English. Near the entrance was a 7-11 branded ATM, so I used the opportunity to withdraw some yen. Next time I’ll know and avoid the exchange ripoff at Sydney Airport. I added 2000 yen to my Suica card at the ticket machine and then tapped into the platforms. A train arrived within five minutes or so, taking me to to Keikyu Kamata, where I had to change to get a train going south to Yokohama. Unfortunately, I got on the first train that appeared, without checking to see if it was express or local. It was local, meaning it stopped at all of the twenty or so stops to Yokohama. After about three stops it waited at the current station for several minutes. Another train pulled in on the opposite platform, and a few people on my train got up and ran across to get on that one. I wondered if I should do the same, but I didn’t want to risk making a mistake and stayed put. Then as the other train pulled out first, I saw the signs on it saying express… I should have done the same thing! Well I made it to Yokohama station eventually, then had to switch to another train line again to go two more stops to Minatomirai, the closest station to the hotel. This involved tapping out and then back in again. Again I got on the first train that arrived, not realising this line also had express and local trains, but this time it was good because it was an express and the first stop was Minatomirai. From there I walked the short distance to the hotel and check in, about 08:00. I unpacked and had a shower in my room. I was given a room on the 29th floor, looking out towards the city, rather than the bay like last time. This gives me an amazing view of the huge sprawling city of Yokohama, and in the distance Mount Fuji. And at night it’s amazing with all the lights. I think this is the best standard room in the hotel, as the two floors above are all full of meeting rooms and restaurants. And this floor, according to the floorplan on the back of my door, is all suites, except for this one leftover area the size of a standard room, which I have. After freshening up, I went out for a walk. I wanted to head to Chinatown for lunch, but first needed some breakfast as I hadn’t eaten the one on the plane. I walked over to the World Porters shopping centre, but it was closed up, apparently being too early for it to open. But checking the centre legend I found a convenience store that had longer hours and got a couple of packaged sushi rice snacks. Then I walked past the old red brick warehouse, where there are lots of touristy shops and food places, but that wasn’t open yet either. I continued south along the waterfront, through Yamashita Park, taking my time. There was a lot of work going on the park, apparently preparing many large flower boxes for a spring display or something. 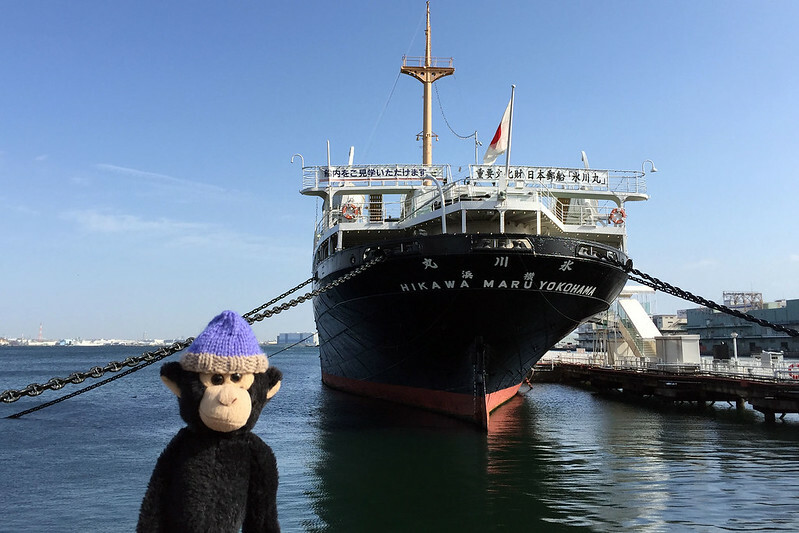 I stopped to look at the small bronze statue of the Little Girl with Red Shoes, and the tall Guardian of Water statue donated to the city of Yokohama by its sister city San Diego, as well as the old ocean liner Hikawa Maru, now a floating museum. Leaving the park, I passed the Doll Museum, and considered going in to have a look, but found that even though it was now after the opening time of 10:00, the museum was closed. I figured it must not open on Mondays. This was to be a theme, with every interesting thing I passed being closed on Mondays. 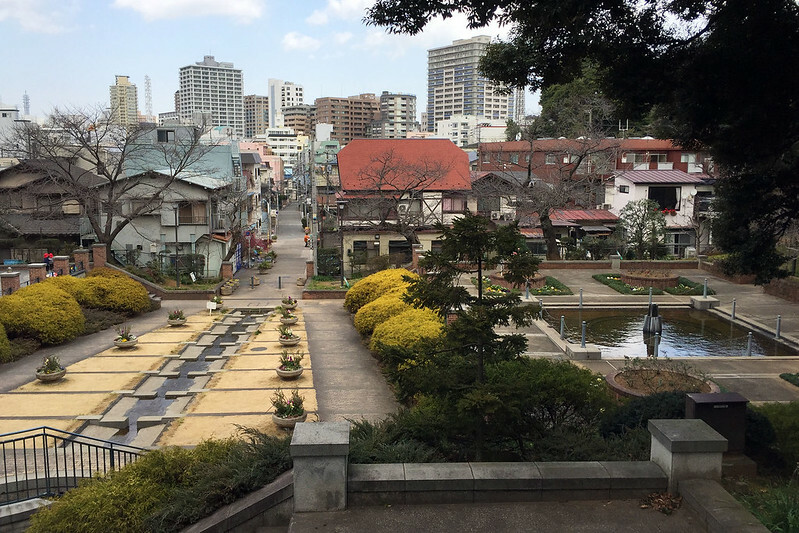 I continued under the freeway into Minato-no-Mieru Park (or Harbour View Park), which had a French garden section, leading up a steep hill to a peak which gave a panoramic view of the bay to the east. Up on the hill here it was really windy, uncomfortably so. The weather forecast predicted rain in the afternoon, and the clouds looked threatening, but so far there was only strong wind to deal with. There was a museum up here dedicated to a writer, but it too was closed. So I walked across to the foreign cemetery and museum, both of which were closed. The pattern was emerging that most things like this were closed on Mondays. So instead I walked down the hill, through Motomachi Park. This was an odd mixture of parkland and old houses in small pockets, tumbling down the hillside. One area had many signs about one Alfred Gérard, a tile and brick maker from France who had his workshops in the area, and apparently supplied much of the building material used in the surrounding buildings. One place was where his water tanks were, and this was now converted into a large koi pond. 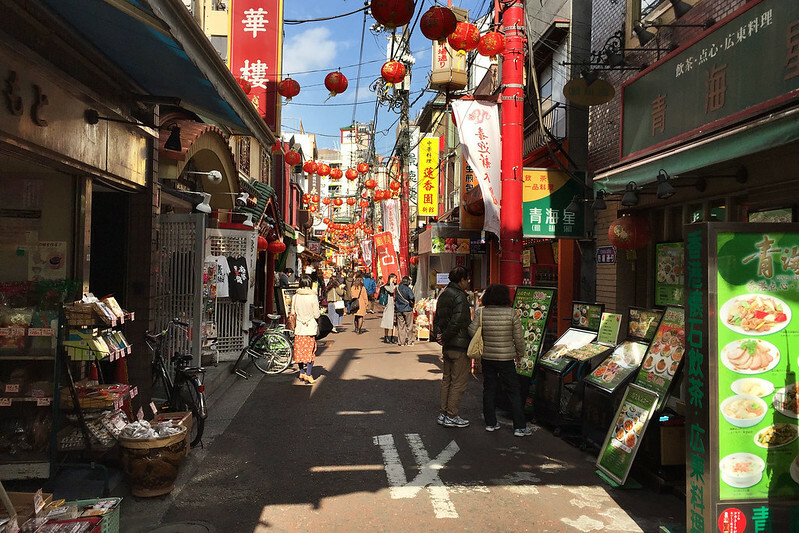 From here I walked to the Motomachi shopping street, which is a narrow old street lined with close set buildings, but fitted out with modern fashion and other shops. There was even free WiFi here on this street, and I sent M. some photos and messages. 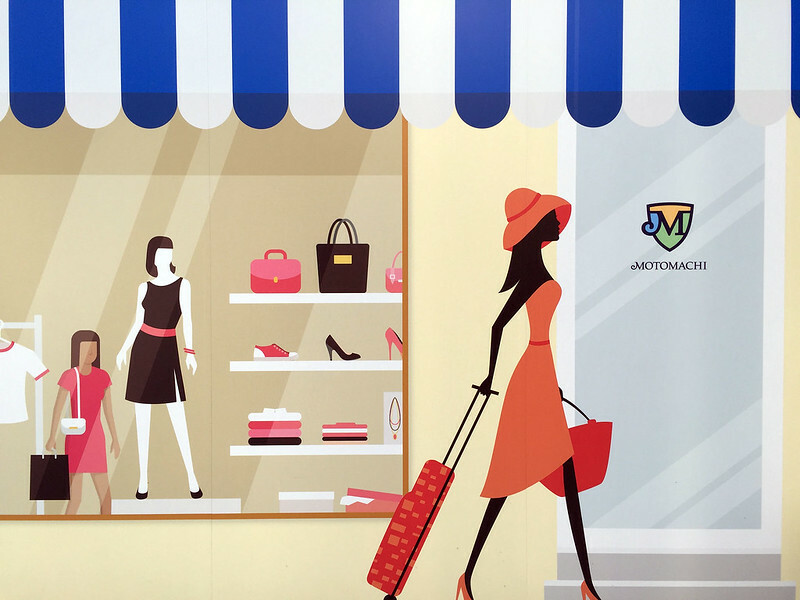 I walked the length of the street, looking at the interesting sights, but many of the shops were not open, either because it was Monday or because it was not yet 11:00, which seemed to be when many of them opened. One shop I passed had a queue of about a dozen people waiting to enter when it opened, and I saw a sign indicating it was having a 70% off sale. At the western end of the street I saw a sign indicating 250 metres to an Italian garden. Curious, I walked up a steeply sloping and twisting road, finding the small garden on top of a hill. It was open, but fairly bare with the winter, and workers were fixing various things. It would have been a nice view of there wasn’t an elevated freeway dominating the nearby area. By now it was around 11:30, and I was getting hungry, so I walked across the river, under the freeway, and into Chinatown. Having been here last year I knew what to expect, and quickly found some places selling steamed buns and dumplings from their shopfronts on the street. First I had a steamed pork belly bun from one place. Then I walked to another where there was already a lunch queue forming, and got a set of four fried dumplings with meat fillings and hot broth inside. These are tricky to eat without burning yourself on the broth. And then not far away was another place selling skewers of four different steamed dumplings, as well as skewers of three sweet fried sesame balls. I had one of each. 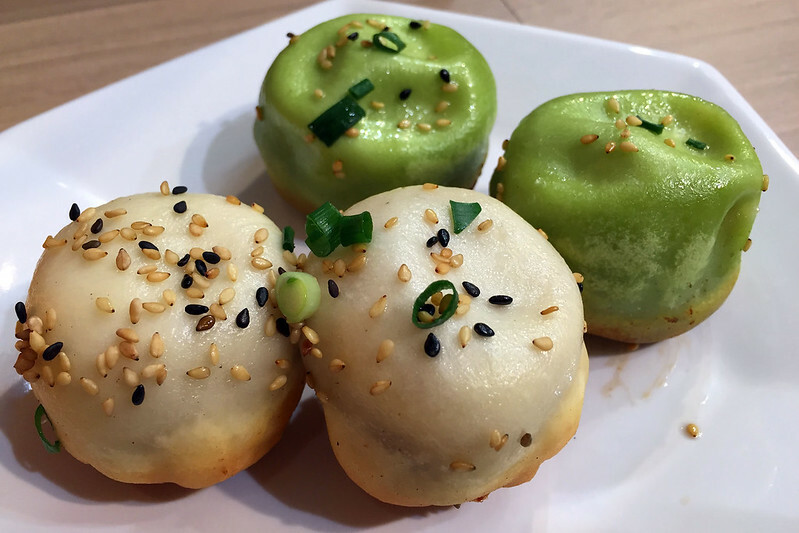 The sesame balls had different fillings: chestnut, black sesame, and red bean paste. This was enough to fill me up, so I walked around a bit more, then decided to go somewhere to sit and rest while I had a refreshing drink. A beer sounded like a good idea, and I found a place labelled as Craft Beer Cafe on my offline map of Yokohama, which was located not far from Chinatown, and also not far from the place I was meeting Matthew and Matsuhashi-san for dinner. So I figured maybe I could hang out there for the afternoon. But when I got to the location, the place was closed. So instead I decided to walk a bit further and go to the beer bar that I knew was in the red brick warehouse, since I’d been there last year. The place was called Beer Next, and I sat at a table and ordered a large size Yebisu Premium Black. This came served in a glass shaped like a boot, and the waiter said something while pointing at the toe of the boot, which I think was a warning about tipping the last sips up in a certain orientation which would cause all the beer in the toe to spill out at once. I relaxed with this cold drink, since I had gotten remarkably warm walking around with my jumper and coat on, and the weather had turned out fairly mild despite the strong wind. I had planned on staying out all afternoon, but by now it was only 15:00, and I was a bit exhausted, so I decided to return to the hotel to rest for a couple of hours before heading out again for dinner. Walking back, the wind really picked up dramatically, and in a couple of places I really had to lean into the wind to avoid falling over or being blow backwards as I was walking. While resting in my hotel room I watched the weather out the window get slowly worse, with grey clouds rushing in and then a light rain beginning to fall, but it was dominated by the wind whistling around the building. Eventually I had to venture out again to go to Bond restaurant. Google maps indicated it was about 25 minutes walk away, and suggested I could catch a train from Minatomirai station one stop to get about halfway there. But looking out the window I could see there was a covered path leading almost as far, so I elected to walk the whole way. It was only the second half of the walk that was relatively exposed anyway, but when I got that far the wind was fierce and the rain, although not heavy, was blown almost horizontally so an umbrella didn’t help a great deal. I kept my head and chest dry, but from the waist down got wet. But I made it to Bond and soon Matthew arrived. As we walked up the steep stone stairs to the restaurant, Matsuhashi-san showed up right behind us. We got a table, and he said his wife and daughter would join us but they were a bit late. We ordered some portions of beef and some salads, and then his wife and daughter showed up. I’d met his daughter twice before, once at last year’s ISO meeting here in Yokohama, and then again when they visited Sydney back in December, but hadn’t met his wife before. She spoke very little English, but managed to laugh a lot during the conversation anyway. 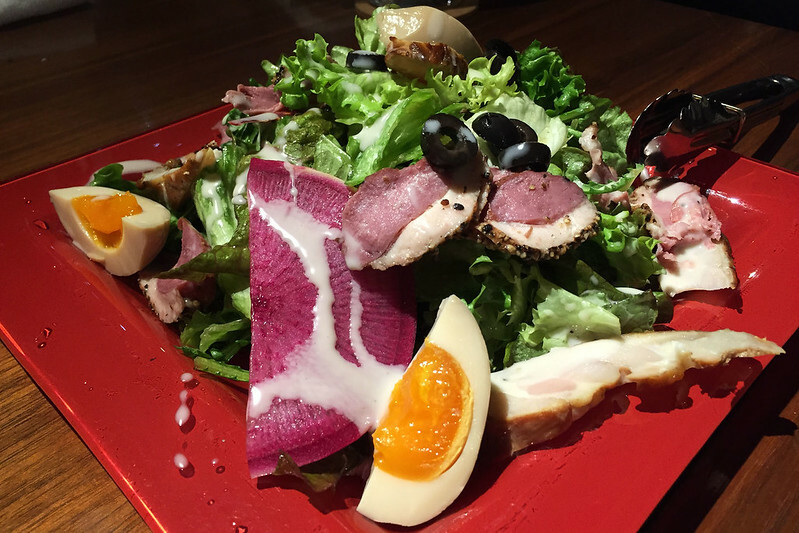 One salad contained slices of smoked chicken mixed with greens, olives, and boiled eggs. The other was thin slices of beef with greens and blobs of mashed potato, topped with a creamy dressing and lots of cracked black pepper. The main portions of beef came seared on the outside and then sliced into bite sized pieces with rare middles. There was a tiny hotplate just big enough to sear one chunk of beef if you wanted it more well done, and a dipping sauce of soy and wasabi. We shared these chunks of meat and the salads, and then ordered some more of the salads, which was plenty to fill us up. Matsuhashi-san insisted on paying for the meal, and Matthew and I promised to shout him next time he was in Sydney. We left the restaurant and were relieved to find the weather had calmed down and the rain stopped. 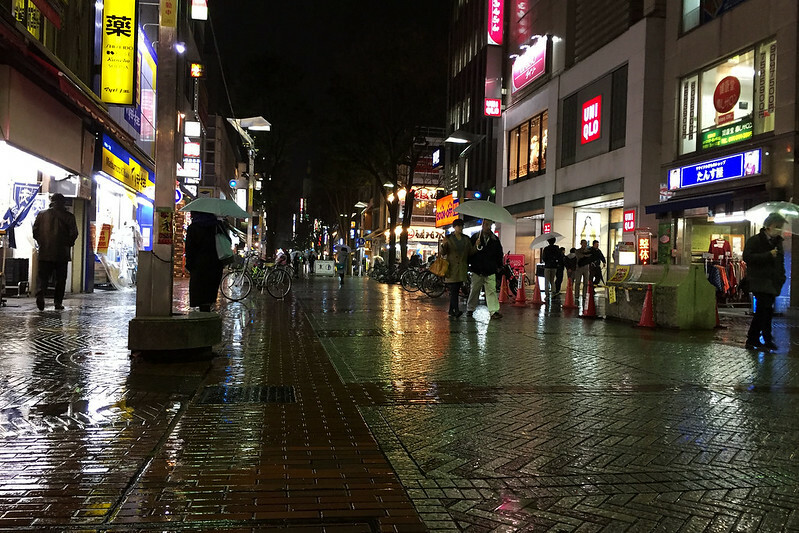 We walked a short distance to the nearest train station, where Matthew would catch a train back to Shinagawa, while the Matsuhashis walked one way and I walked in a different direction, so we all said goodby and dispersed. On the way back to my hotel, I popped in at the convenience store nearby to buy some prepacked sushi rice snacks for breakfast, keeping them in the fridge in my hotel room until morning. The long day over, I relaxed briefly before dropping into bed. This entry was posted on Monday, 27 February, 2017 at 21:18	and is filed under Diary. You can follow any responses to this entry through the RSS 2.0 feed. You can skip to the end and leave a response. Pinging is currently not allowed.